Step1. 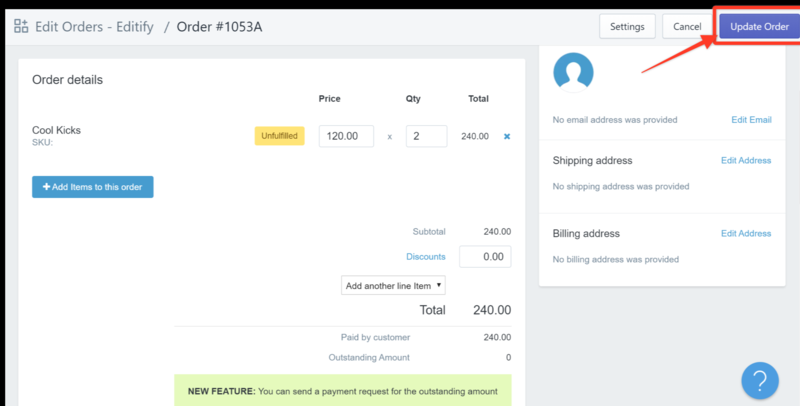 Launch the Editify app from your Shopify admin page. Step2. Click Go to Orders. Step3. Click on the first order that you want to edit. Step4. Once the order page comes up, click the drop-down arrow and click Editify. Step5. Edit any of the details in the order as necessary such as the price, quantity, items, discounts, line item, and so on. Congratulations! You now have successfully edited an order.